1. Control the craziness in the kitchen. 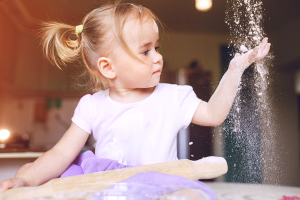 Kids love to bake, but their lack of patience and steady hands can be trying when egg shells end up in the bowl and flour ends up everywhere but the bowl. To help things run smoothly, have all your ingredients pre-measured so little ones can simply pour them into the mixing bowl. Let them stir, but only after you’ve mixed in the dry ingredients to avoid a ‘flour shower’ erupting from the bowl. If you’re making cut-out sugar cookies, give them their own piece of dough to make their very own creation – they keep busy and will know that’s the one cookie they get to eat fresh out of the oven. 2. Pre-cut wrapping paper and tape. With kids, it’s amazing how wrapping one small present often requires an entire roll of paper and tape. But a little pre-planning ensures kids can join in gift wrapping without blowing your holiday budget on tape and wrapping paper. Just pre-cut small pieces of tape and stage them on the edge of a table. And pre-cut wrapping paper to size for your various presents, then invite your little ones to help fold and tape. 3. Have a wrapping paper / tree placement plan. If you’re like many, you may have found yourself at one time or another crawling under the tree reading tiny gift tags to find the presents you need for a particular gathering. Choose different styles of wrapping paper for each gathering to make them easy to find as you’re rushing out the door. Another great idea is to place the presents ‘in order’ under the tree. Think through when each gift will be given and place them accordingly with the earliest gifts up front. 4. Skip the Mall Santa. Not that mall Santas aren’t great. They are. But they often involve long lines and a hefty price tag on professional photos. Research local restaurants, churches and pre-schools in your area and odds are you’ll find a free Santa appearance where you can take your own photos. 5. Stock up on batteries. 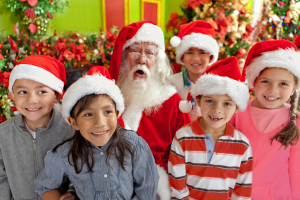 When giving an electronic gift, it’s great to include the batteries so kids can enjoy their present right on the spot. Since this doesn’t always happen, keep lots of batteries on-hand if you are hosting the gift exchange. 6. Check your local library for festive books, CDs and movies. Fun holiday stories, movies and music add so much to the season, and don’t cost a thing when checked-out from the library. 7. Spread out gift exchanges whenever possible. 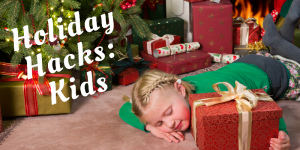 When kids are inundated with too many presents at once, it’s hard for them to appreciate them all. 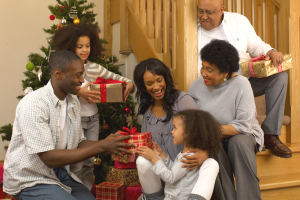 If you’re seeing friends and family throughout the season outside of formal parties, consider exchanging gifts then. One gift on an otherwise ordinary night will mean so much more than five gifts received all at once. 8. Prepare for the holiday road trip. Holidays mean seeing family, which often means road trips with crazy traffic and sometimes bad weather. Plan ahead as much as possible. Time your trip to avoid rush hour, pack plenty of snacks (ideally things that won’t lead to a crumbly mess in your backseat), and lots of entertainment. New toys or toys that have been tucked away for awhile will stretch the entertainment value. 9. Prepare your kids for gifts / foods they don’t like. Although we’ve all been there, it’s still embarrassing when your child opens a gift and exclaims, “I have this already,” or “I don’t like ___.” Or sits down at a beautiful meal and says “Ew, what’s this?”. While kids will be kids, it’s great to prep them ahead of time with reminders to simply say “Thank you” for a gift, or “No thank you” to foods they don’t like. 10. Take lots of pictures, and don’t stress over the bad ones. 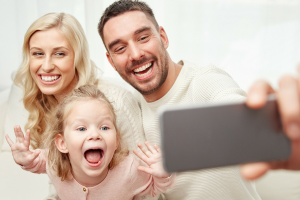 A perfect family photo is wonderful…but often unrealistic with kids involved. The goofy smiles, crying Santa pictures and funny candid shots will be even more memorable and cherished in 10 years. Enjoy the moment and the magic of the holidays. From all of us here at S.O.S, Wishing you a joyous holiday season! Do you have a favorite Holiday Hack? Share it in the comments below or on the S.O.S Facebook page. Don’t forget to follow us on Facebook, Twitter, Pinterest and Instagram, too! This is a great idea! Thanks Ronda!